Rumors of a Google smartwatch being built by the company itself have been floating around for a while, but now a report suggests that Google’s Android team is the one working on the project. The report comes from the Financial Times and it quotes “Silicon Valley’s rumor mill” when it says that it’s not the X Lab, the skunworks responsible for all the Google Glass madness (including the ability to control objects around the wearer), that’s working on the project. It’s the Android team itself. 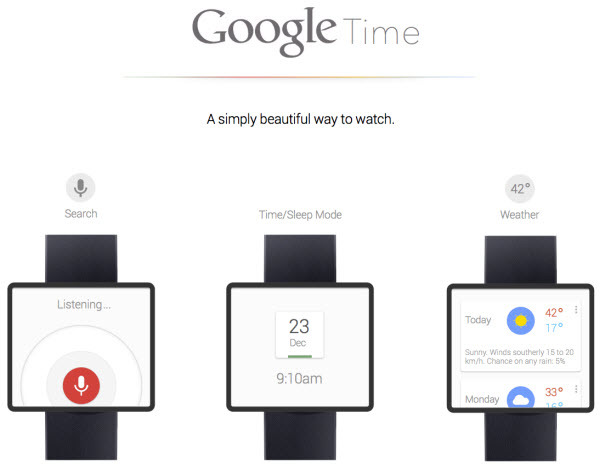 I don’t think anybody can say at the moment whether the watch will look anything like the Google Time concept (pictured above), but it could take some features from a patent application that Google has filed in 2011, and which was approved in 2012. There is one major difference, though – the patent application mentions a wireless transceiver inside the watch, while the Financial Times’ sources say that the watch will be a companion to an Android smartphone (using Bluetooth or another wireless technology to connect to it). The design that the patent filing included was quite interesting, using a flip up display, which it used as a viewfinder for the camera – you can see one of the attached drawings below. The source mentions another important thing – if you think this and the Samsung smartwatch project (which is reportedly coming) are one and the same, think again. This is a completely different thing. No idea of a release date or price, of course. Would you buy one when it comes out?